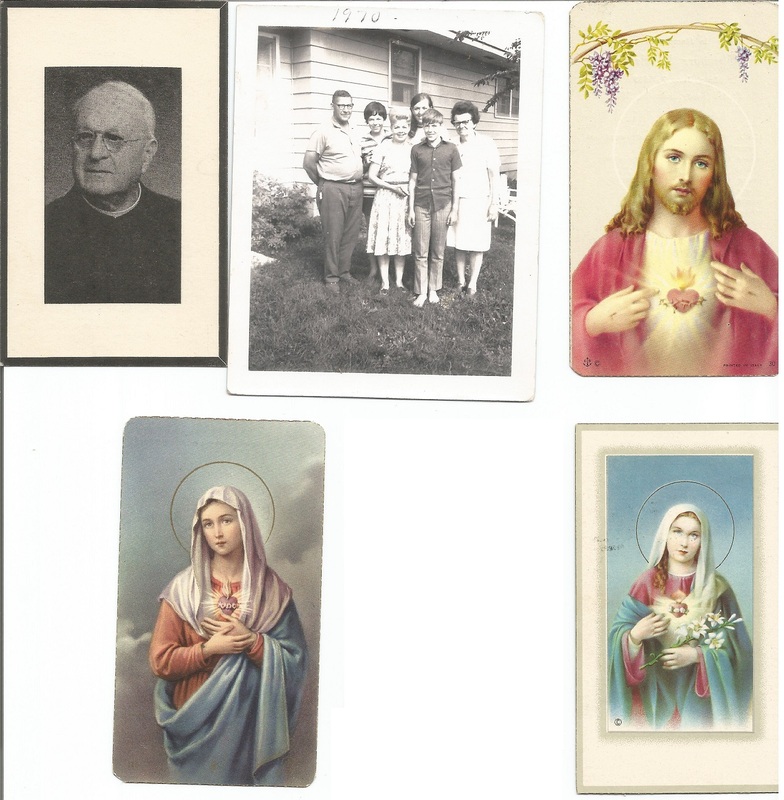 Ach, it's surprising how much stuff I "inherited" after mom passed away in 1996...and how much I've forgotten I even have. 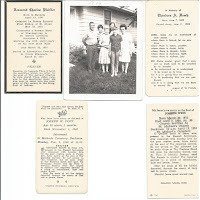 There are three boxes the size of peach crates (remember them? 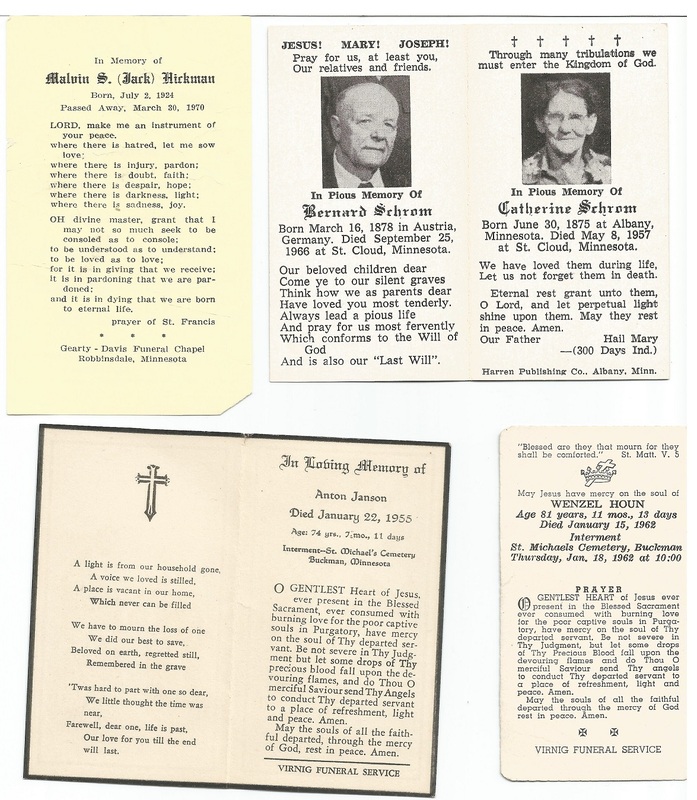 ), one with black & white photos, another with color photos, and another with flotsam and jetsam. A few weeks ago, I opened that third box looking for one thing but finding another, as always happens. 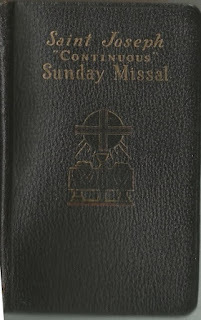 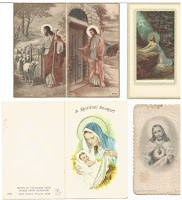 There was dad's missal, The St Joseph "Continuous" Sunday Missal, imprimatur 1957. 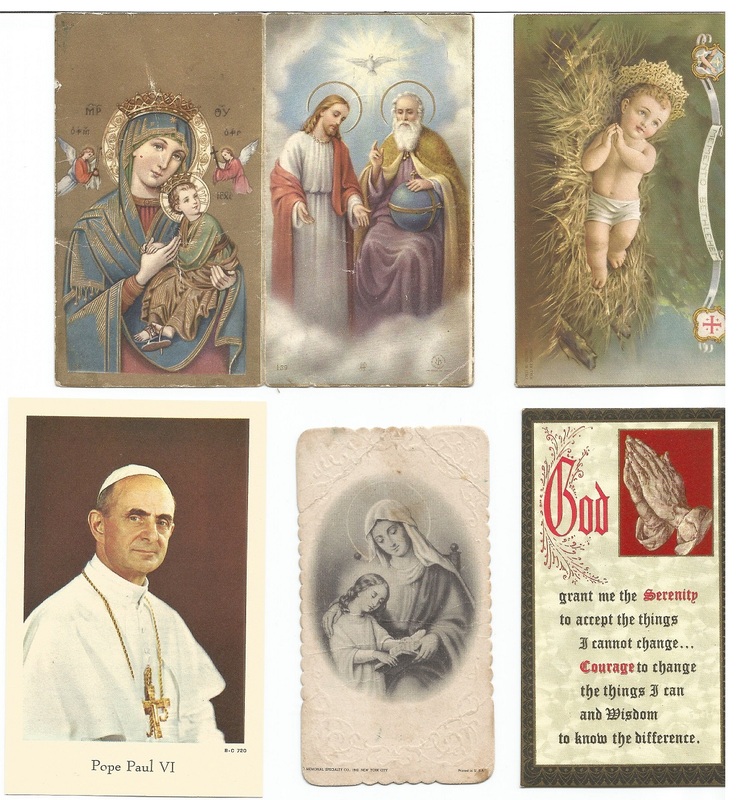 It was a funny old religion back then, where Catholicism, nuns and priests were basically infallible, and a bazillion angels and saints were hovering, waiting to judge our every demand/request. 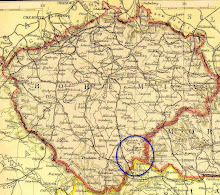 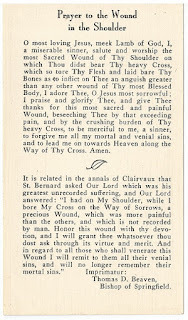 Remember the word "beseech"? 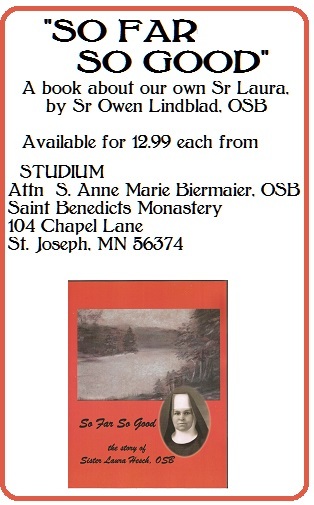 I have a feeling Curly the Usher picked this book up after it spent a few lost weeks in a back pew. 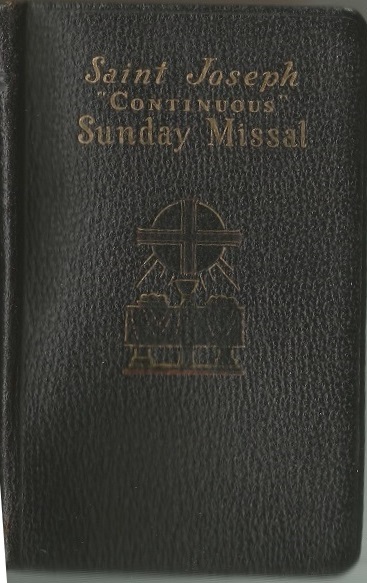 He needed to be holding a missal if he were demanding that we follow the mass in ours, but I doubt he ever bought it. He liked pictures, just like we did, and he had a collection. 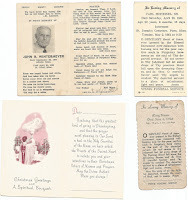 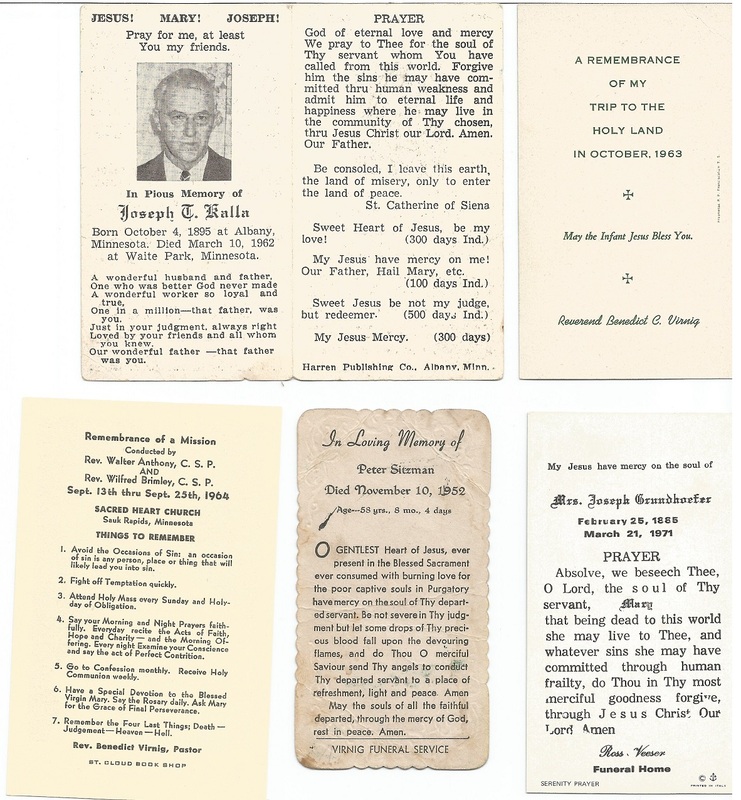 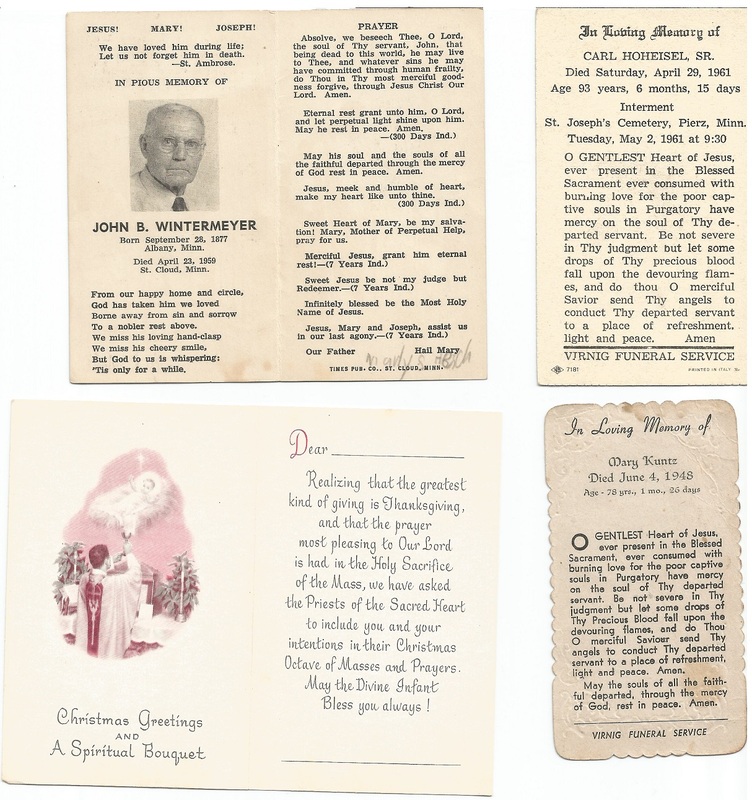 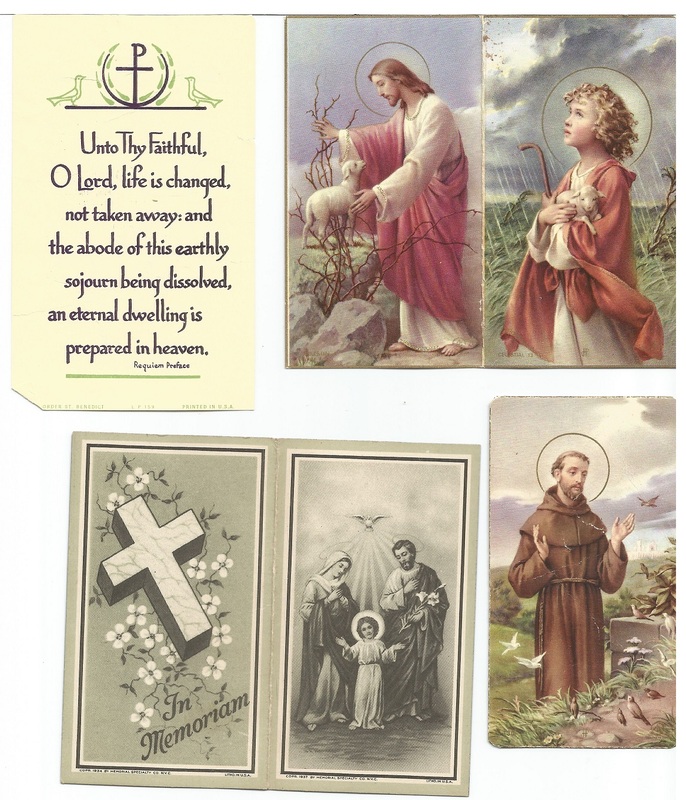 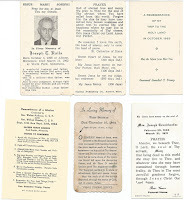 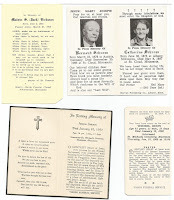 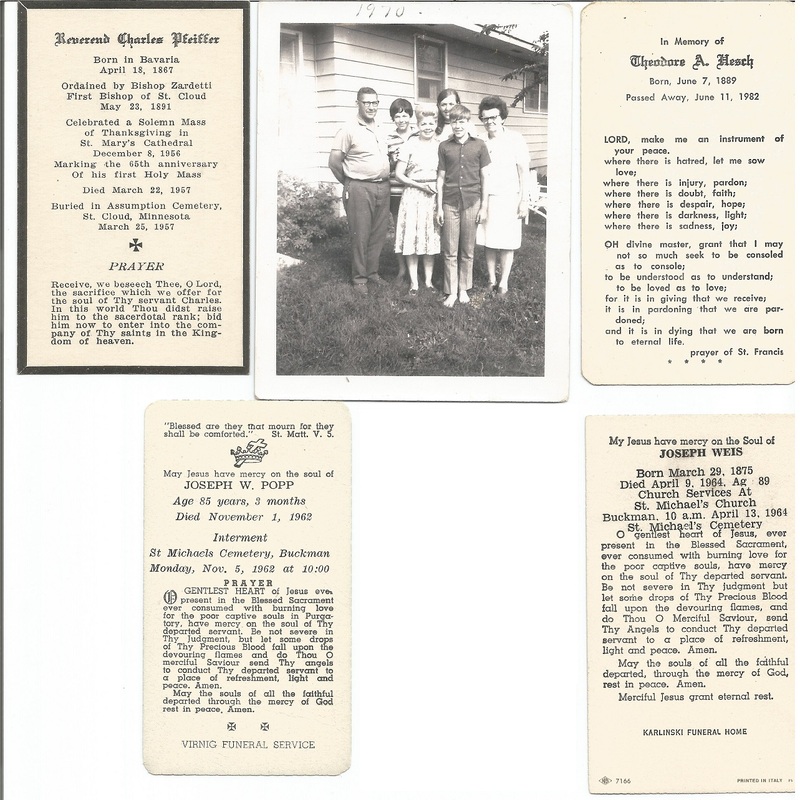 Inside, every 25 pages or so, dad kept clusters of funeral or prayer cards. Most I recognize, but a couple may have been the original owners' ☺. 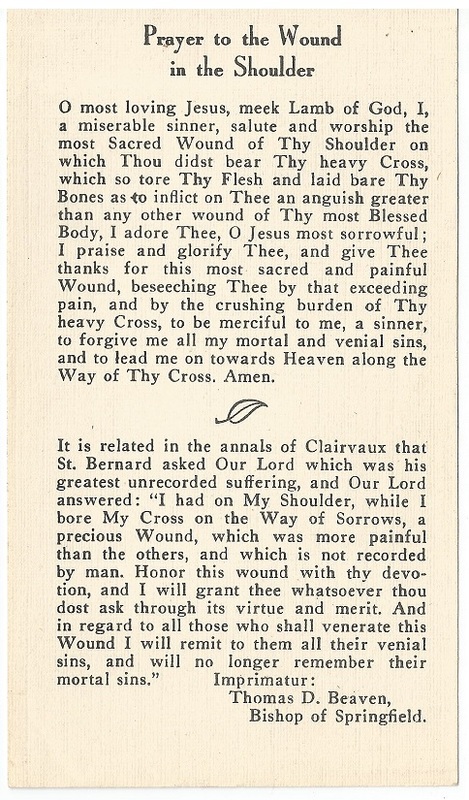 Yup, all from the missal. 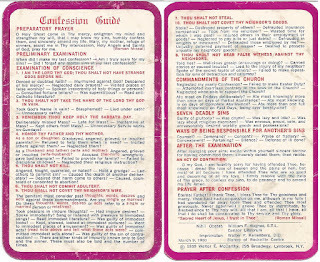 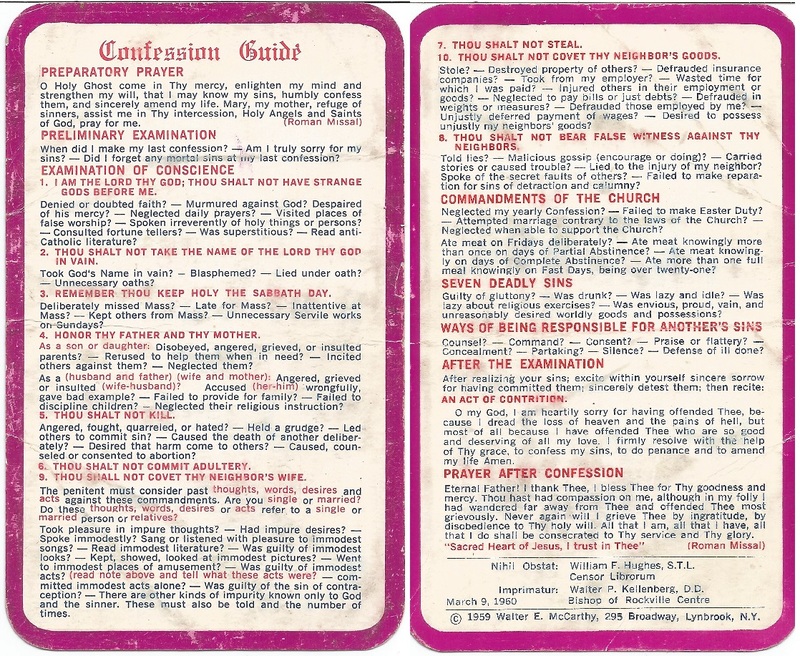 Bonus: A scan of the famous laminated Confession Guide we all carried around (still makes me feel guilty)...and an odd esoteric prayer that almost explains the indulgence-mindset that Martin Luther found so disgusting (read the bottom paragraph first).